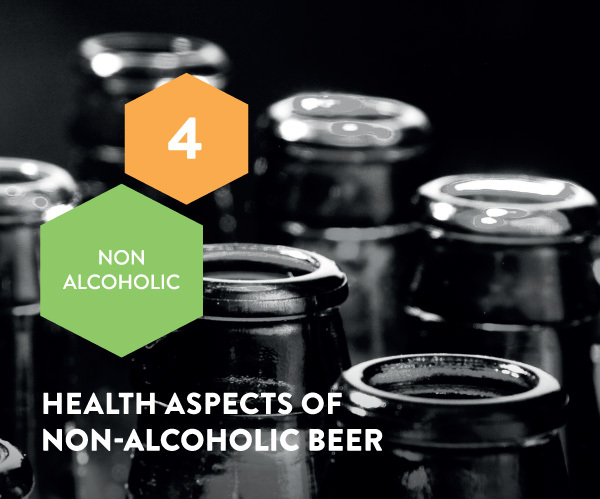 Non-alcoholic beer is increasingly popular in many countries, and this beverage may also influence health. It may be a good alternative to regular beer after sports, may have positive effects when breastfeeding, with evidence from literature suggesting that it may reduce anxiety and help people to sleep better. However, all these health effects require further investigation. 0.0% beer and low-alcoholic beer (<2%) are good alternatives to regular beer (4–5%) especially after exercise for rehydration, but more research is needed. The effects of non-alcoholic beer on breastfeeding need further investigation to confirm any positive effects on breast milk composition and lactation. In depth research is needed to confirm the positive results from early studies on the impacts of hops in non-alcoholic beer on improved sleep and anxiety levels. Although more research is required, non-alcoholic beer appears to be able to influence cardiovascular biomarkers. Non-alcoholic beer may in some countries still contain a small amount of alcohol, due to national definitions. But 0.0% beers exist and are labelled as such. In some countries, beer labelled as non-alcoholic may still contain a small amount of alcohol due to differing national definitions. However, 0.0% beers also exist and are clearly labelled as such. It is very common in many team sports to drink beer together after exercise, training or matches.87 Beer contains carbohydrates, sodium (see Chapter 2) and fluid, which are important in recovering after physical exercise. However, the alcohol in beer has a diuretic effect, which means that it increases urine output. To rehydrate the body, it is better to choose beer containing 2% alcohol or less. A number of studies have evaluated the diuretic effect and rehydration capacity of beer with different alcohol contents from 0% to 4%. Results from these have generally shown that the stronger the beer, the less it is able to rehydrate the body.88,89 However, 2% or less alcohol did not increase urine output or affect blood volume levels after exercise-induced dehydration. Beer with 4% alcohol reduced the recovery rate of blood volume levels compared to 0.0% beer. More fluid was retained when extra sodium was added to a beer with 2.3% alcohol,90 or if people could drink as much water as they wanted together with 660 ml of beer (4.5%),91 A small amount of alcohol (2% or less) may not affect fluid recovery when one is in a dehydrated state, though drinks containing 4% alcohol can delay the rehydration process. It appears, however, that more research is needed to determine the exact alcohol percentage that influences urine output, relevant blood levels and fluid balance. Non-alcoholic beer may stimulate secretion of prolactin, a hormone that enhances the production of breast milk. The mechanism behind this is unknown, but could be due to specific compounds derived from barley.93 In addition, non-alcoholic beer consumption may increase the antioxidant capacity of breast milk. An experimental study found an increase after 30 days of drinking 660 ml of 0.0% beer per day. The mothers also benefited from these effects themselves as oxidative damage in their body decreased, reflected in decreased levels of compounds involved in oxidative stress.94 More research is needed, however, to determine the exact effects that non-alcoholic beer consumption may have on the health of both mother and child. Hops are used for their flavour and preservative capacities in making both alcoholic and non-alcoholic beer. In the human body, the constituents of hops appear to have some sedative effect and thereby may even positively influence sleep and anxiety. The bitter acids and the compounds xanthohumol and myrcenol in hops are probably responsible for this effect, and research suggests that the main mechanism of action of hops is to increase the activity of the neurotransmitter -aminobutyric acid (GABA). When the level of GABA increases in the brain, its neural activity decreases. However, as there are few studies examining the effect of 0.0% beer on sleep and anxiety, more research is needed. Two experimental studies examined the effect of non-alcoholic beer on sleep95,96 with some groups drinking 330 ml of 0.0% beer during evening meals for two weeks. In a study with work-stressed nurses, sleep quality improved with reduced sleep latency (the time it takes to fall asleep) and decreased restlessness during the night. Results were compared to one week when the nurses did not consume non-alcoholic beer during evening meals.95 Sleep latency also decreased visibly in university students during a stressful exam period, but students rated their overall sleep quality higher than a week before the experiment when they did not consume non-alcoholic beer.96 These two studies only examined the effects of non-alcoholic beer on sleep, and more in depth research is needed before conclusions can be drawn. Besides improving the quality of sleep, non-alcoholic beer may also reduce feelings of anxiety. Some experimental studies have examined the effect of 0.0% beer on anxiety levels in a stressed population. Subjects rated their stress levels lower after drinking non-alcoholic beer for two weeks compared to a control period when they did not drink non-alcoholic beer. A decrease in urinary levels of 5-HIAA (high levels of this compound have been found in people having anxiety disorders) was also seen after drinking 0.0% beer for two weeks. All these studies came to the same conclusion: that drinking 330 ml of non-alcoholic beer during evening meals on 14 consecutive days may decrease feelings of anxiety and stress.95-97 These results are promising, but it must be stressed related research is still at an early stage. As well as alcohol-containing beers, non-alcoholic beer can also have positive effects on cardiovascular health. Two studies suggest that polyphenols may play a role. In one intervention study with men aged 55–75 years old, a decrease in inflammation factors such as IL-6 was found when consuming 990 ml of non-alcoholic beer (<1 g alcohol) each day for four weeks, with a corresponding decrease in blood pressure of 12–16% and decreased homocysteine levels.98 In another study with the same subjects and research design, an increase in endothelial progenitor cells was found (stem cells that repair and maintain endothelial walls of blood vessels). These results are most likely to be caused by hop-derived compounds such as the polyphenol xanthohumol.99 However, little research has been conducted on this topic, and more research is needed before conclusions can be made. The foetus grows and develops during the whole nine months of pregnancy, and it is known that drinking alcohol during this period can lead to neurological disorders, birth defects and mental health problems (see Chapter 8).100 The exact amount of alcohol that may harm a baby is unknown, so the best advice is not to drink alcoholic beverages at all. Non-alcoholic beer (0.0% alcohol) might be a good alternative, however.